A hookah is a water pipe for smoking tobacco, which traditionally comes in various flavors to enhance the experience. The hookah has a social element that many people enjoy, as the pipe is shared by several smokers, and is a common social custom in many cultures, and originated in ancient India and Persia, continuing to the present day. Unfortunately, hookah smoking carries the same – or worse – health effects as smoking cigarettes or other tobacco products. 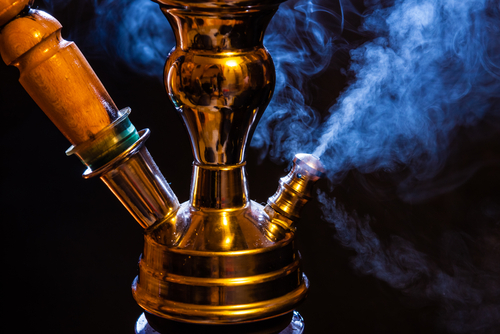 The Mayo Clinic has issued information reporting on the health effects of smoking a hookah. The health impact of hookah smoking can extend beyond the known effects of tobacco, as the charcoal used to heat the tobacco increases the risks, as it produced carbon monoxide, various metals and other cancer-causing elements. The smoke from a hookah is not purified by passing through water, and the toxic agents are passed to the smoker. Some of the toxic agents present in the smoke and tobacco are known to cause lung cancer, bladder cancer and oral cancers. Beyond these health risks, the passing of the pipe from person to person increases the risk of developing illnesses and infections through saliva. While smoking a cigarette will require about 20 inhaled breaths, hookah smoking tends to be longer, and an hour of smoking a hookah can involve up to or more than 200 inhalations. The American Lung Association (ALA) has issued warnings about the growing trend in hookah smoking, particularly for those aged 18 to 24. There are many flavors that appeal to young people, called “shisha.” The attraction for young people involves social interaction and the ability to engage in a shared activity, but the impact health impacts are not minor. Young people must be warned against the health effects of hookah smoking. The added threat is that the warm hookah mouthpiece creates the perfect environment for spreading diseases such as tuberculosis, hepatitis and herpes, as well as other infections, bacteria and viruses. The ALA also warns that a study of Arab-American teens established that the odds of a teen experimenting with cigarettes was more than eight times greater if the teen had ever smoked a waterpipe. Hookah bars and cafes have sprung up all over the USA, often established near a college or universities, with the majority of these enterprises located in major cities. States and municipalities may have lagged in passing regulations for these establishments, and have allowed exceptions for retail tobacco establishments, opening the door for the trend to continue, posing a serious health risk for young people drawn to the practice. Be the first to comment on "Hookahs – As Harmful as Cigarettes"